Appliances designed to simplify data movement in and out of Azure, both offline and online. Moving stored or in-flight data into the cloud is a challenge. Data Box devices provide solutions for both scenarios. Offline Data Transfer - Data Box, Data Box Disk, and Data Box Heavy PREVIEW are offline data transfer devices which are shipped between your datacenter and Azure. Data Boxes use standard NAS protocols (SMB/CIFs and NFS), use AES encryption to protect your data, and perform a post-upload sanitization process to ensure that all data is wiped clean from the device. Online Data Transfer - Data Box Edge and Data Box Gateway are online data transfer products. Data Box Edge is an on-premises network appliance that can move data into and out of Azure, and has the ability to add AI-enabled edge compute to process data during upload. Data Box Gateway is a virtual appliance for moving data in and out of Azure. Data Box Disk is not available in the Brazil South region. Please select another region. Data Box Disk is not available in the Central India region. Please select another region. Data Box Disk is not available in the Germany Central region. Please select another region. Data Box Disk is not available in the Germany Northeast region. Please select another region. Data Box Disk is not available in the South Africa North region. Please select another region. Data Box Disk is not available in the South Africa West region. Please select another region. Data Box Disk is not available in the South India region. Please select another region. Data Box Disk is not available in the West India region. Please select another region. 1Up to 5 disks per order. 2First three days (including day of delivery) constitute the grace period and are charged a single unit of daily usage fee. Beyond the 3-day grace period, daily usage fee applies. 3The shipping fee is for one full roundtrip. *Prices above reflect GA pricing, which will take effect April 1, 2019. Order processing fee and Daily disk usage fee will be discounted 50% through April 1, 2019. Standard storage rates charged separately as applicable. We provide technical support for all Azure services released to general availability, including Azure Data Box, through Azure Support, starting at $29/month. Billing and subscription management support is provided at no cost. We guarantee at least 99.9% availability of the Azure Data Box & Azure Data Box Edge/Data Box Gateway services. Availability is calculated over a monthly billing cycle. Customers are billed when the order has reached a terminal state (i.e the order has completed without errors). For how long can I keep an Azure Data Box Disk at my premises? 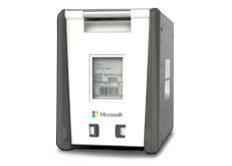 The Data Box Disk can be kept on-premises for a maximum time period of 45 days. Is there a charge for a lost or damaged device? Yes. The charge for a lost or damaged Data Box Disk is $-.